In my Christian circles, I hear a lot about how feminism has diminished the high calling women have as wives and mothers. I saw a sign at a local community college that said, “a woman’s place in on the jobsite.” It was advertising a forum for women on careers in technical fields. But it was an obvious take off on the saying, “a woman’s place is in the home.” I feel pretty confident in the choices we have made for our own family, so I don’t resent such statements much one way or the other. But one thing I have noted is that in Christian circles, we often tend to overcompensate in our attempts to correct whatever wrong thinking we diagnose in our culture. In regards to our role as women, I see a trend among conservative Christian women in feminist cultures to overcompensate by placing an emphasis on children and home that goes beyond what God intended and instructs. I’ve long thought that a husband and children can become an idol in a Christian woman’s life just as quickly as any feminist goal we are reacting against (I know this because I’ve been there, done that). I don’t think we ever really understand our idols until they are threatened. That’s when our responses indicate whether they or our God are our identity and security. We MUST differentiate clearly between being a good steward of the gifts God gives us and elevating those gifts to a place of idolatry. Do you stress over what kind of meal to bring to the sick? Is your identity tied to how well you impress the person who receives your meal? Are you embarrassed to have others to your house because it doesn’t meet a perceived standard of hospitality? When your child acts out at playdate, are you humiliated? Do you beat yourself up? Or if you do not have husband, child, or house, do you feel that your life is in a holding pattern until they come along? Are you secure on who you are IN CHRIST? Does it sustain you even when you can’t, despite your best efforts, live up to the perceived standard in your Christian culture of what a godly Christian woman looks like? I’ve posted before about singleness in our marriage centered Christian culture. I’d like to end this post with some particular thoughts on infertility. This is for those of you who value the high calling of motherhood and long to raise a brood to love Jesus. But despite your good desire, you are coming to realize your powerlessness to make this happen. How do you not just exist, but live abundantly, in a culture that values children so much? Do you know enough of the character of your God to believe deeply in His goodness despite these circumstances? Dickinson must have been long acquainted with the frustration of waiting. Though likely written about a lost love, her poem well articulates the annoying problem of waiting for a child with no indication of when (if ever) your wait will be over. If you have been trying unsuccessfully to get pregnant, you have likely experienced feelings similar to the bee Dickinson describes that flies about your head threatening its sting but never fulfilling its threat. Wouldn’t you just rather KNOW? Many couples go for years without getting pregnant with no documentable problem with either spouse. What do you do? How long do you wait? Should you try to adopt? 6And the Lord said, “Listen to what the unjust judge says. 7And will not God bring about justice for his chosen ones, who cry out to him day and night? Will he keep putting them off? Oh, but He is! God is notorious for using the worst of circumstances to work the best of things in His children’s lives. This is His trademark. Think of Job, Joseph, Hannah, Ruth, etc. He brings bad circumstances into our lives, forcing us to lose our life so that we may truly find it. Then He teaches us the meaning of true abundant living. Dying to ourselves is painful. But believe that the work He is performing in your life defies expectation. This is fundamentally Who our God is. Godly contentment is possible! At issue is the tension between actively pursuing the God-ordained act of raising children and resting contentedly in this waiting time. God is working good things in your life at this stage. This stage of infertility can be a sweet time of friendship and sharing in your marriage. It could be a time to minister to others in far away locations. Maybe God has called you to a time-consuming ministry in town you won’t be able to do later when you have children. Despite His waiting to fulfill your desire to have children, He has prepared works in advance for you that will contribute to a life of abundant joy—even at this stage. Ephesians 2 10For we are God’s workmanship, created in Christ Jesus to do good works, which God prepared in advance for us to do. Philippians 4 11I am not saying this because I am in need, for I have learned to be content whatever the circumstances. 12I know what it is to be in need, and I know what it is to have plenty. I have learned the secret of being content in any and every situation, whether well fed or hungry, whether living in plenty or in want. 13I can do everything through him who gives me strength. I Timothy 6 6But godliness with contentment is great gain. 7For we brought nothing into the world, and we can take nothing out of it. Psalm 90 14 Satisfy us in the morning with your unfailing love, that we may sing for joy and be glad all our days. Short of creating embryos that will be discarded (some may disagree with me here), this decision is up to you, your spouse, and your conscience. There will be times for you to go forward with treatments and times for you to step away from the process. Only you can say at what point you stop trusting God and start trying to manipulate your way around His will. He is sovereign over this process, and He opens and closes the womb. Through His common grace, He has given doctors good knowledge on this subject. It’s always wise to be informed as long as that information doesn’t cause you to trust in man over God. Psalm 20 7 Some trust in chariots and some in horses, but we trust in the name of the LORD our God. Psalm 40 4 Blessed is the man who makes the LORD his trust, who does not look to the proud, to those who turn aside to false gods. These emotions are common but never justified. We must deal with them simply as the sin they are. In Christ, we are no longer slaves to sin. We have the supernatural power of the Holy Spirit working in us to conform us to the image of Christ. We DON’T have to give in to these sins. Rebuke yourself when you see this attitude surface. Repent to Christ and force yourself over the hurdle to be kind and honest to those you resent. Romans 13 13Let us behave decently, as in the daytime, not in orgies and drunkenness, not in sexual immorality and debauchery, not in dissension and jealousy. Romans 6 18You have been set free from sin and have become slaves to righteousness. If women who have not struggled with this issue seem to respond to you callously, give them the benefit of the doubt. Most likely, they are simply ignorant of the emotional battles you are facing. Educate them honestly about your situation. Women who love Christ will appreciate your honesty and want to come alongside you in support during this time. It is essential that church members mutually share individuals’ burdens. This speaks to the heart of what it means to be members of the Body of Christ. Paul was honest about the hardships he suffered so that his brothers and sisters in Christ would be unified with him in both the sufferings and the comfort of Christ. 12The body is a unit, though it is made up of many parts; and though all its parts are many, they form one body. So it is with Christ. … 21The eye cannot say to the hand, “I don’t need you!” And the head cannot say to the feet, “I don’t need you!” 22On the contrary, those parts of the body that seem to be weaker are indispensable, 23and the parts that we think are less honorable we treat with special honor. And the parts that are unpresentable are treated with special modesty, 24while our presentable parts need no special treatment. But God has combined the members of the body and has given greater honor to the parts that lacked it, 25so that there should be no division in the body, but that its parts should have equal concern for each other. 26If one part suffers, every part suffers with it; if one part is honored, every part rejoices with it. Many Scriptures already listed address this concern. God constantly works negative things in our lives for our good and His glory. The story of Job is the classic example of God bringing horrible circumstances in the life of a believer DESPITE his uprightness of character and obedience. According to Job 1, it is because of Job’s righteous character that he is picked for this burden. Satan accuses Job of obeying God only because God is good to Job. If God brings hardship to Job, Satan believes Job will reject God. So Job’s story is about proving God’s worthiness to Satan. In hardship or blessing, trial or glory, God is worthy of praise and adoration. Like Paul’s sufferings, God is working in your life to make known to heavenly powers that He is worthy of praise. Ephesians 3 10His intent was that now, through the church, the manifold wisdom of God should be made known to the rulers and authorities in the heavenly realms, 11according to his eternal purpose which he accomplished in Christ Jesus our Lord. 12In him and through faith in him we may approach God with freedom and confidence. 13I ask you, therefore, not to be discouraged because of my sufferings for you, which are your glory. Job 1 20 At this, Job got up and tore his robe and shaved his head. Then he fell to the ground in worship 21 and said: “Naked I came from my mother’s womb, and naked I will depart. The LORD gave and the LORD has taken away; may the name of the LORD be praised.” 22 In all this, Job did not sin by charging God with wrongdoing. I hope this gives food for thought for first making sure your desire for children is not idolatrous, and then second dealing with the phenonemon God often uses to change us into His image — giving us a desire for something He says is very good and then making us WAIT for the fulfillment of that good desire. Thank you so much for this post. I'm about to forward it to some of my friends who are also “waiting.” I've been reading your blog for quite sometime now and have not written a comment to tell you how much I appreciate it. Thank you for your honesty, thoughtful insights and for continually reminding me of the gospel. I'm sure you are a busy woman, but I'd love to hear more on some of your points in this post! Thank you, again! May God continue to bless you as you seek Jesus and point others to him. Thanks, Destiney! Which points were your interested in hearing more about? thanks for sharing a great post, and for reminding me that my identity is not in the home or my family, but it is (and always) in Christ. though i have not personally experienced infertility, we have been going through some financial struggles for what seems like a long time, and these points were very encouraging and convicting (particularly #1). thank you for your helpful insights. I am blessed by your articulation of these truths. Though I haven't faced infertility, your discussion of identity is wonderful. when I left medicine to be a full-time mom, one of the other women physicians told me “I could never do that, because being a doctor is my identity.” Thankful for Christ, I was able to tell her that my identity was outside of myself. But oh, how quickly do the roles we fill try to creep in and decieve us into thinking they are what gives us value! My cooking, my cleaning, my writing, my mothering, my wifliness, even my christmas decorating, threaten to usurp my understanding of my value as Christ's daughter! Thanks for asking Wendy, number 3 and number 7 are points that come up a lot in discussing this with other women in my church (and for myself!). There are many other trials in life that make us women feel alone in the struggle… but infertility in particular seems to be one that can feel quite isolating. And number three just comes up ALL the time! #7 is hard, because it requires something of someone else as much as it requires it of you. The hard truth is that it's not until someone has personally suffered that they are equipped to walk with someone else who is suffering. You may find your best encouragement from women at other stages of life, particularly older women who have had enough life experience to have walked painful roads concerning children. Two weeks after I miscarried our first child, a friend I hadn't seen in a while asked in a bright, almost obnoxious manner, “When are you guys going to have kids?” I told her honestly that we had miscarried just 2 weeks before. I had a choice to keep it to myself, turn away, and be bitter with her. But I made myself tell her the truth in an informative but non-confrontational way. She was ignorant of the power of her words to wound someone. And for her benefit, I tried to open her eyes to it. I really appreciated this post, as I have been noticing the same trend you mentioned about women reacting to the feminist movement by elevating their positions as wives and homemakers to the point where they find their identity in this instead of Christ. I have to say I've struggled with it myself. Our hearts are so deceitful! I just started reading your book today after hearing about it on another blog. 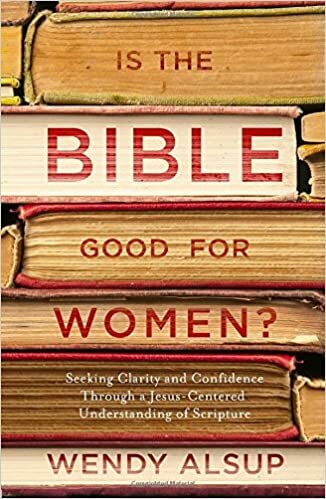 I've thought for a long time that someone needed to write a book on theology for women–thank you! (This is another disturbing trend, men AND women who think women don't need to know the deep things of God.) I find myself saying yes, yes, that's right! a lot. Thanks so much for writing this! I'll be following your blog to learn more. wow I am blown away at how the LORD spoke through you. Thank you so much for posting this. I too have delt with infertility and I have learned many of the things you have mentioned here. I will pass this on. A weighty and wise post. I greatly appreciate your insights regarding our tendency to overcompensate. So true! And your words to those struggling with infertiltiy are both truthful and comforting. Well said. Hi Wendy, I was just directed to your blog today by a link from my sister on Political Angst–God knew I needed to read this post. You may have no idea how God has used this post to encourage me today! My husband and I are in the midst of dealing with infertility, and today is a difficult day in particular. I'm going to meditate on the scriptures and the principles you've written here. Thank you! My husband and I have struggled with the death-experience of infertility for 13 years and counting. This post is probably the best attempt to start addressing it in a sensitive and biblical way. Well done, and thank you. Love this article and my heart rejoices in the truths that you lay out here about infertility! I am so thankful that God taught me years ago that if I am not content without children then I will never be content with children! And what a joy it has been to receive from God's hand the gifts He had for us instead of the gift that we thought would bring us happiness! He is a Good and Faithful God that gently leads His sheep and He knows us better than we know ourselves. Thanks, Jennie. I am interested in hearing your story one day. I know you can fill in gaps in my own understanding on this topic.